Silage leachate is a high strength waste which contributes to surface and groundwater contamination of various pollutants from runoff, direct leaching through concrete storage structures, and infiltration of runoff. Feed storage is required for the majority of dairy operations in the country (which are expanding in size and fed storage requirements) leading to widespread potential contamination. Limited data on silage leachate quality and treatment has made management and regulation based solely on observation. 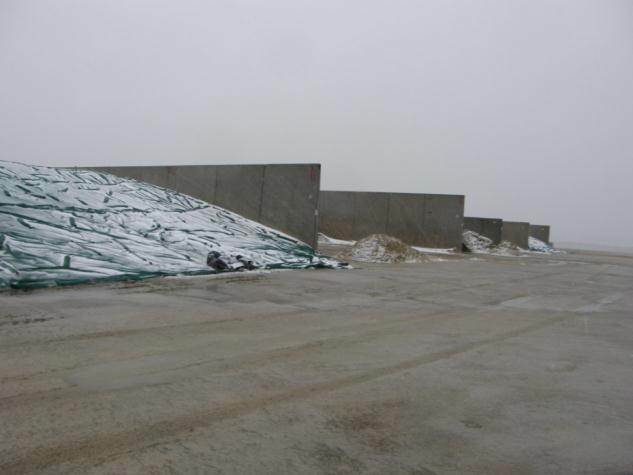 This project investigated three bunker silage storage sites to assess the water quality characteristics of silage leachate and runoff from various feed sources and surrounding environmental factors. Surface samples were collected from feed storage structures and analyzed for numerous water quality parameters. Using collected hydrologic data, contaminant loading was analyzed for various storm events and assessed for first flush effects and potential to impact handling and treatment designs. Determination of first flush provides essential data for separation of waste streams (high and low strength) to ease management in terms of operation and cost, reduce loading to treatment systems, and reducing the overall environmental impact. Why Is It Important to Characterize Silage Leachate? Silage runoff, or the flow of surface excess water over an area containing silage or silage leachate, contains nutrients harmful to watersheds. Nutrient concentrations within silage runoff are variable and are dependent on event size, seasonality, bunker condition, and concentration of silage. Knowledge of nutrient loading thoughout a storm can benefit silage runoff storage and treatment standards. Three horizontal bunkers in south central Wisconsin were anzlyzed over the seasons of fall, spring and summer. Two of the bunkers sampled were designed with subsurface leachate collection. Runoff was collected using ISCO automated samplers and samples were triggered by flow rate. 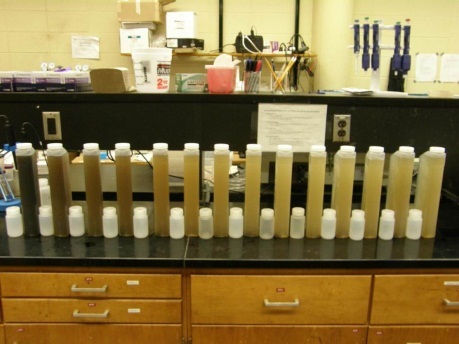 Water quality analysis was completed on the campus of University of Wisconsin – Madison and alkalinity, NH3, BOD5, COD, NO2, NO3, ortho-p, pH, TKN, TP and TS were analyzed. Thirty-five storms in total were analyzed ranging from 0.03 – 1.74 inches. Seasonality can impact the nutrient concentrations within silage runoff. Normalized cumulative pollution load curves illustrate moderate first flush in the fall and a moderate delayed load curve in the summer. Correlating silage runoff concentrations with bunker conditions such as date, amount filled, moisture content, and amount of litter present on pad could help explain seasonal variability. Collection of future storms could aid in explaining variances and facilitate modeling.